The vision was easy; the execution and installation intense—and I wouldn’t trade a minute of it! Guests entered through double-gates and were instantly immersed in vintage Hong Kong Street Market-meets-High Rise Dining Chic. The environment was rich in traditional elements: custom built cherry blossom trees, vintage rickshaws, and medieval Chinese warrior statues. One chinese character is used for “ram,” “sheep” and “goat” so life-size statues of each were attached to “their” street carts that displayed wares such as vintage leathers, fresh fruit, and antiquities. Children were agog at demonstrations from authentic Chinese candy and dumpling masters. A discreet forest of hawthorne fruit delighted adults who craved a bit of the old country. The stage set atop the jacuzzi was flanked by 2 immense 7-foot tall hand-carved ice sculptures of rams that literally glistened in the night’s light. The bars were stocked and a delicious assortment of Asian appetizers were tray-passed as performers took their places. Amber-toned lanterns towered above seated guests as they dined on resplendant red shantung linens and sipped from glassware rimmed with antique gold designs. 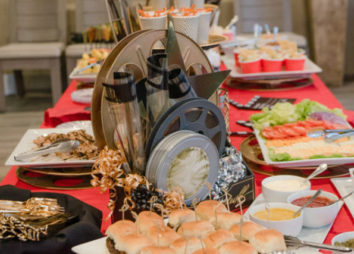 The children’s table was decorated with the same care and precision as the adult tables and offered celebratory crowns and special gift bags of “swag” for its tiny diners. 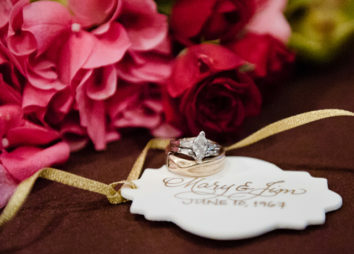 Guests were treated to sleekly wrapped, lavish party favors that were set atop each place setting. Compact but abundant monochromatic florals finished the look. Dinner show performances were perfectly orchestrated and included fire dancers, a silk aerialist, “mermaids” in the pool, and a special guest celebrity singer held guests enthralled. A background of cherry blossoms and oversized lanterns was skillfully lit and studded with traditional Chinese favor bags in the gorgeous pool house/dessert room. 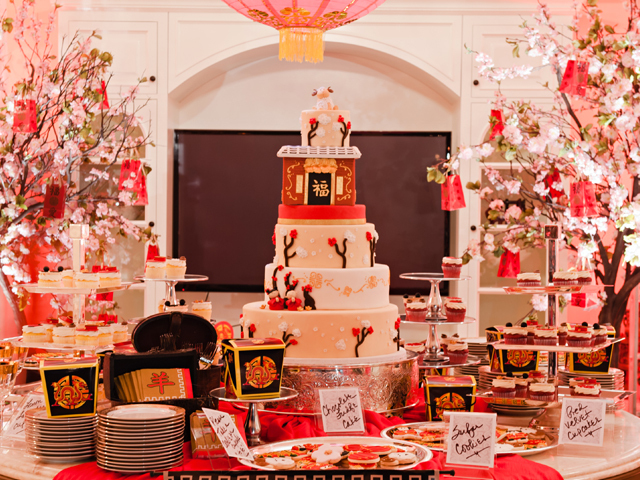 An intricate tiered cake was topped with a sweet rendition of a vintage tea house. Elaborately decorated cupcakes and cookies surrounded the cake and were decorated with Chinese gold coins, rams heads, and Chinese characters (all custom designed and edible!). The traditional family-style Chinese dinner included many desserts served tableside, so this decadent sweet table offered oversized Chinese take-out boxes for take-home indulging. It is always a pleasure and delight to work with my client on this lavish and one-of-a-kind event!